1. Will you be visiting? 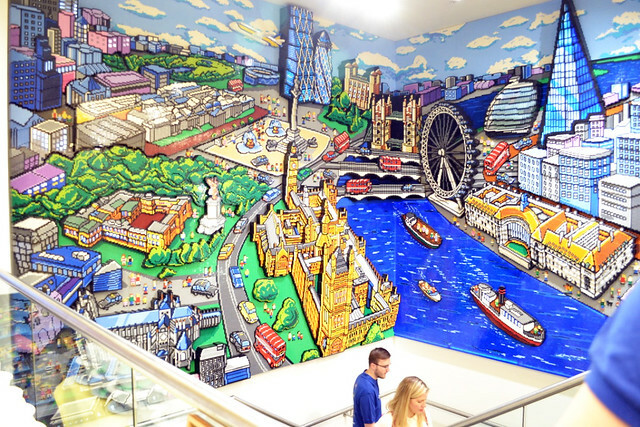 There's a new store in London Town, which is the company's 14th brand retail store in the UK, and the 37th in the world. 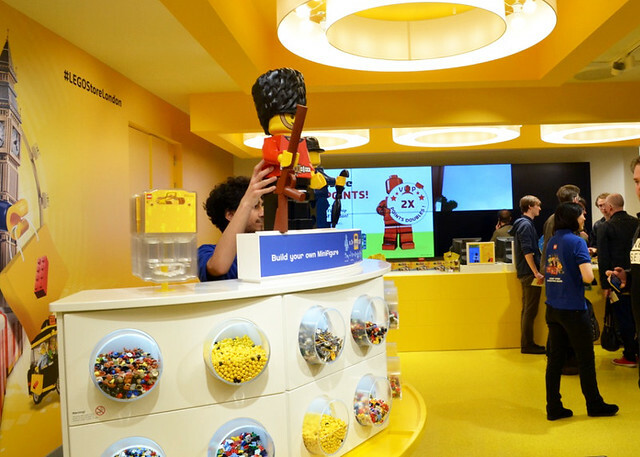 It is now the largest LEGO store in the world, occupying 914 square meters over two storeys. 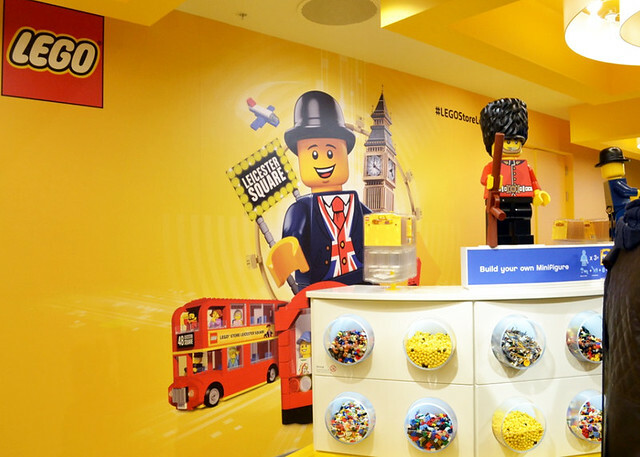 This is the UK's flagship LEGO store and joins two existing stores in London. 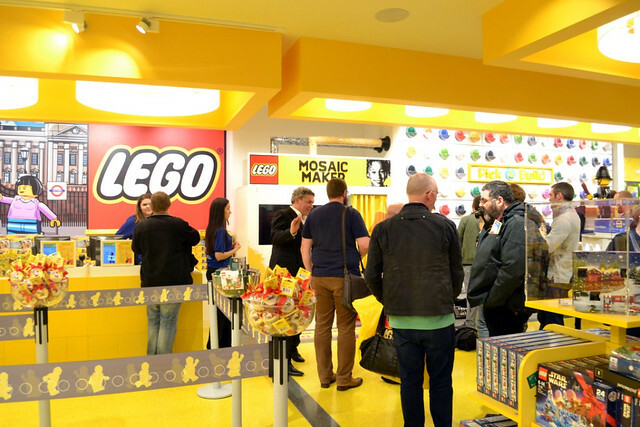 The LEGO Group hosted an RLUG event to allow fans a sneak preview of the surprises they had planned for this new store. Peppermint_M and I went along representing Eurobricks. 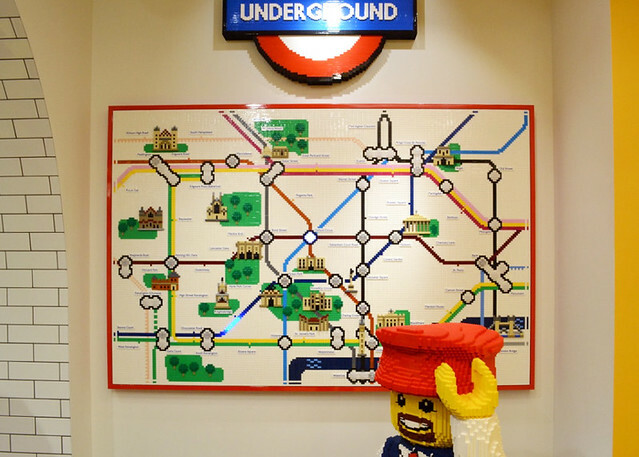 The two existing stores are located in shopping centres to the East and West of this massive city, and they're nice enough stores, but there's nothing specific to draw you to them, obviously aside from the LEGO! This brand-spanking new store is slap-bag in the middle of Central London, situated as it is on the Western side of Leicester Square. It is undeniably prime real-estate, being so close the major cinemas which host the London Premieres of Hollywood (and British) films, and it is in the heart of tourist attractions, being on the short walk from Covent Garden through Leicester Square to Piccadilly Circus. 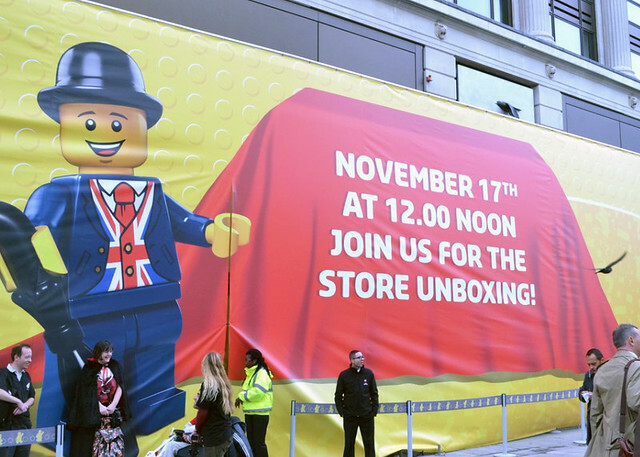 When we visited, it was the day before the Grand Opening, and the store is all wrapped up like a ginormous LEGO set. There's just a slit in the covering (guarded by security) through which to gain access. As we arrived, people were already gathering, and it was clear that the massive covering over the store was drawing a lot of attention from passers-by. As I mention, the store is right on Leicester Square itself, in fact taking up a corner of the square. 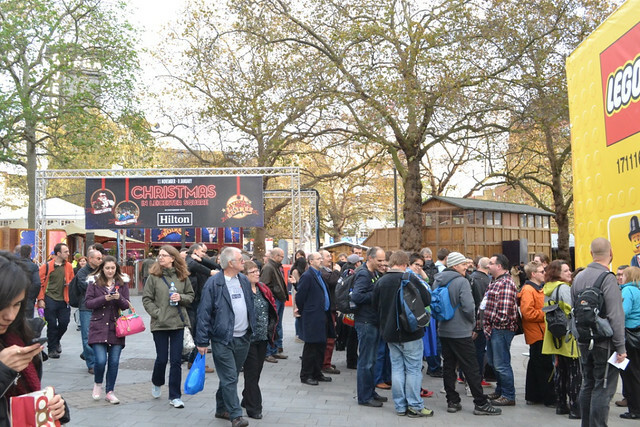 This is looking over Leicester Square; the greenspace is taken up with a festive pop-up, and the building on the far side is one of the major cinemas to regularly host Hollywood film premieres. To a round of applause. Absolutely every single person who came through the doors got a round of applause, which is possibly the least British thing to do! This did rather have a tendency to flummox people, who were somewhat bewildered at their applause. It was, however, the beginning of a continued effort from all at TLG to make us all feel welcome and comfortable. Once our bewilderment passed, the next emotion was probably awe, as this store is a sight to behold. Before we could strike out and explore, we were warmly welcomed by one of our favourite Danes. And told to behave. Anyone who remembers KimT from the Star Wars forum will know exactly what I'm talking about. We were also welcomed by Glenn Abell, the Vice President of D2C (Direct to Consumer) EMEA (Europe, Middle East & Africa), with whom we also had chance to briefly chat. He was a lovely gentleman to talk to, and he spoke openly about the various work the team had put in in order to ready the store for opening. Something that really resonated with Peppermint_M and myself in our brief interview with him was how he spoke of collaboration. To him, the achievement of opening such a large and exciting store was truly built upon the foundation of collaboration; ideas and suggestions came from all quarters which were gradually refined, improved and implemented. Back to our impressions, and at first it was quite difficult to really see much of the store itself, as there were so many people present. 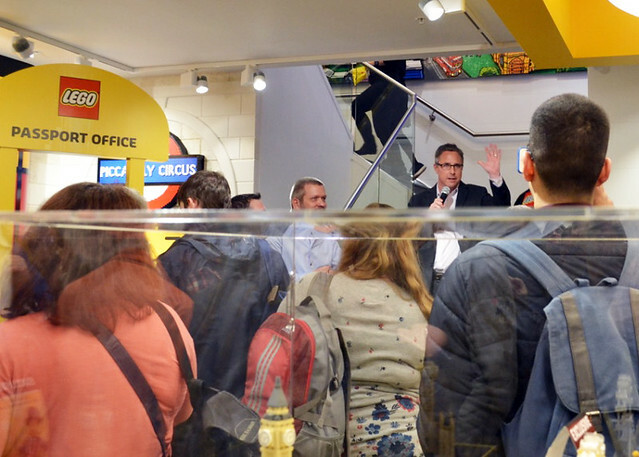 There were over a hundred guests, with the LEGO company team, the store staff and, as we were soon to find out, a bevvy of waiters and waitresses handing out cakes, scones and other sweet treats. 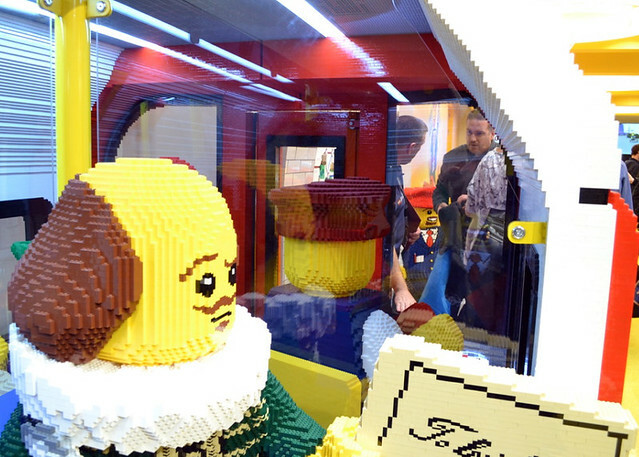 Is that a life-sized LEGO model of a London Underground Tube carriage?? Complete with Shakespeare, a Coldstream Guard a footballer (soccer player) and of course, the Queen. Oh my. There is even a seat for you to sit on, and an ideal photo opportunity. The store staff, who are incredibly friendly, will happily offer to take your picture any time you stray too near this magnificent structure. The Tube carriage was built in partnership with Transport for London (TfL) and the model stands at 2 metres high and 5 metres long! 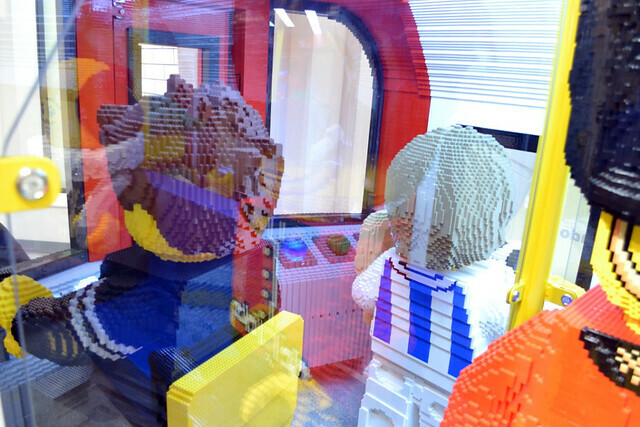 It is composed of 637,902 LEGO bricks, weighs 2126Kgs and took 3399 hours to build. It's also pretty much spot on. Understandably, sections are partitioned with colourless perspex, but you can still see the detail and the characters. It really is quite something. There's also humour! It's great to be able to walk right up to the front of this incredibly built train and peer inside and spot - oh look! 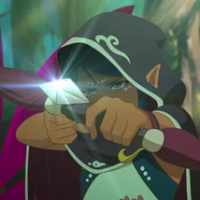 There's Robin Hood! Another well known Tube commuter! Next to the Tube train is the brick-built Tube map I mentioned. It is really focusing on the most central part of London, but it has all the stations labelled for the areas it shows. Including, much to my (and probably a few other people's) amusement: Mornington Crescent station. It's beautifully done, and has details of the sights to be seen around the numerous stops, and also features lights behind some of the Tube lines, which move along as though they are trains. 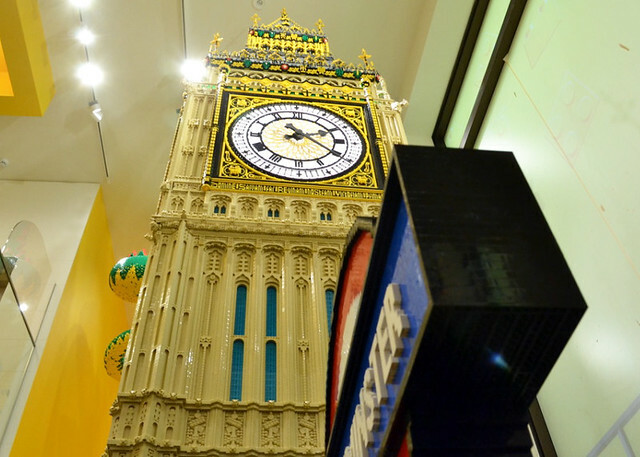 This was made from 16,500 LEGO bricks and took 90 hours to build. I doubt they just made it up as they went along, though, and like everything the design will have taken a significant amount of time. 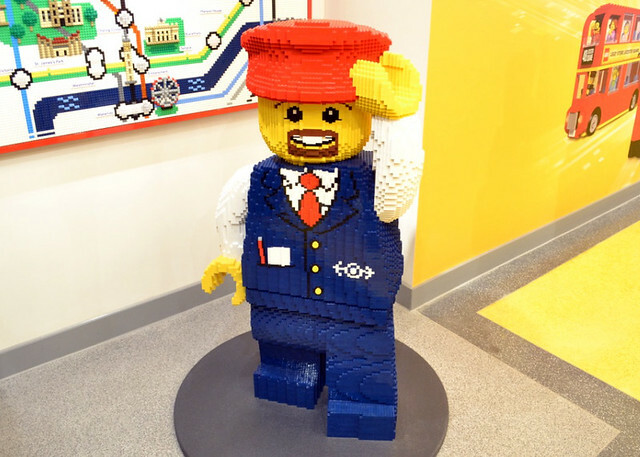 A considerably more cheery (and considerably less lackadaisical) Tube driver (with the LEGO Trains logo! ) than the driver of the train stands nearby to greet you and amiably pose for photos with you. He only has one pose, though, and he's not very chatty. Next to the Tube section is a rather large Build a Minifigure 'Tower', complete with four different talking LEGO Minifigures: Lester (who we'll meet later, but you can see him everywhere), a Royal Guard (Coldstream Guard), Bobby the Policeman (geddit?) and Sherlock Holmes. The company have wisely allowed a huge amount of space around this area. Indeed, this was something that was most noticeable (and commented on by KimT) that there really is a sense of space in this store. I doubt there will be that sense again, as I imagine it will be packed out every moment it's open, but at least there is space to start off with. 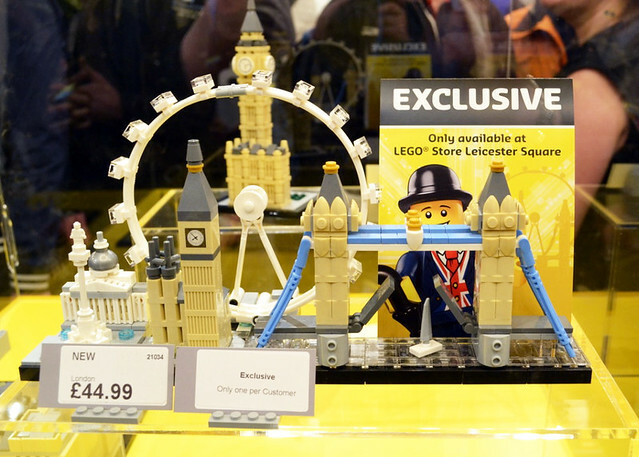 So one of the exciting products available here is the new London Skyline Architecture set. It will be on general release from January 2017, but for now, if you want one then this is where you need to be. If you want more details about this exciting new set, then checkout Bob De Quatre's rather spiffy review. Just finish reading this first. Not only is the set here, but also the designer! Here is Rok Žgalin Kobe himself signing sets for those of us who purchased one. He was a very nice chap, although he seemed overwhelmed by the attention he was receiving. Attention well-deserved, in my opinion. 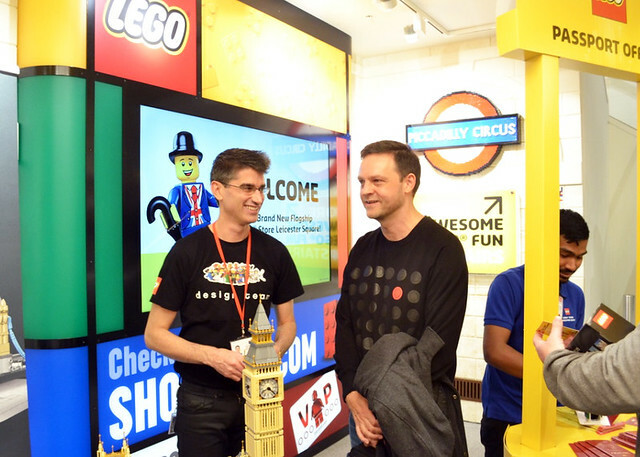 Well known LEGO designer Jamie Berard was also here, designer of the iconic 10253: CREATOR Big Ben set (amongst so many other things). There were plenty of those sets here, despite it showing as 'Hard to Find' on Shop@Home, so another reason to make a trip here, maybe? There are a few other things here to talk about. Firstly, there's the Passport booth. Glenn Abell told us that he was pleased to bring a fun idea that had worked so well in the United States over to this store in the UK. 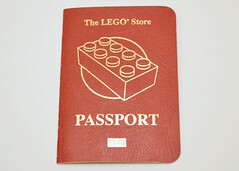 It really is a fun concept - everyone gets their own passport, and you can add your own picture, customising it with LEGO stickers. Then, as you move around the store, there are store employees who have different stamps (three in total), so as you visit each section you get a stamp. The attention to detail with this store is wonderful. 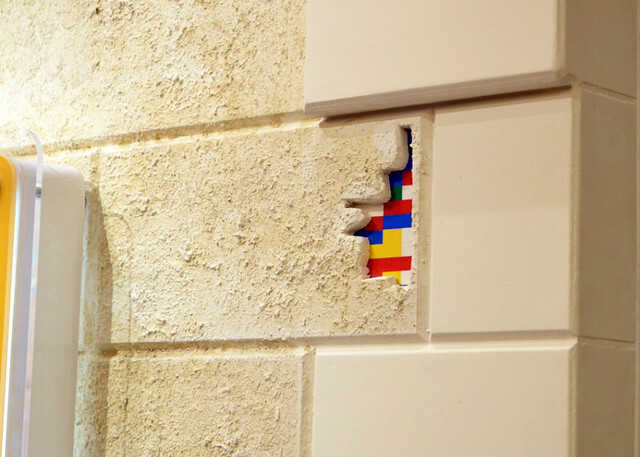 There are bits of the masonry "chipped away" to reveal what's supposed to look like LEGO bricks. Before we head up the stairs, just the other side of the lift (elevator) we can meet Lester, the store's mascot. 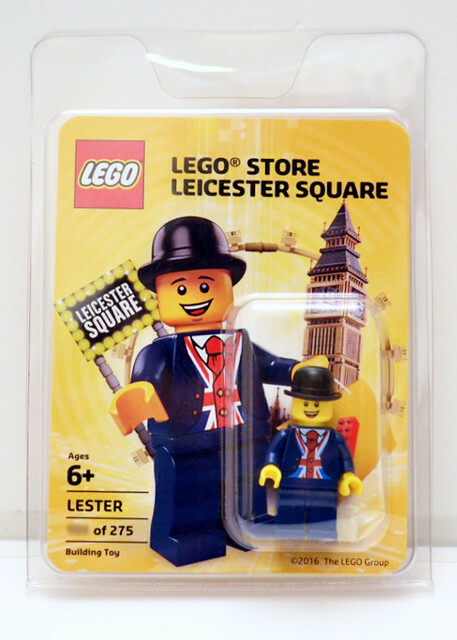 Lester evokes a traditional British aesthetic; with his Union Flag waistcoat, Savile Row suit, bowler hat and umbrella, he looks every bit the City Gent. He has his own podium, in a special corner, complete with papparazzi background. 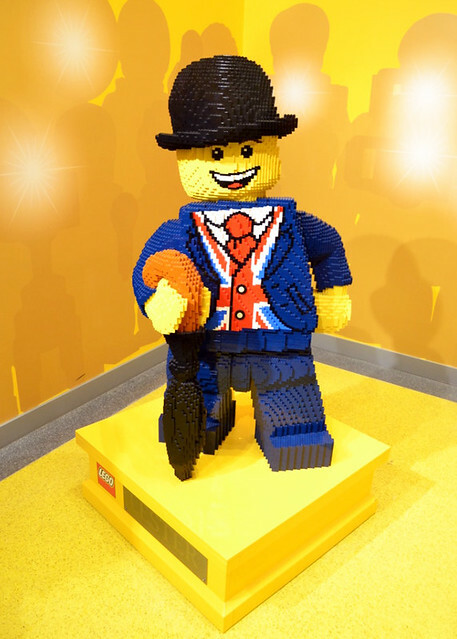 He stands at 1.2 metres tall (on top of his 30cm high plinth) and comprises 24,500 LEGO bricks. Glenn Abell mentioned that this is the first time a store has had a mascot. 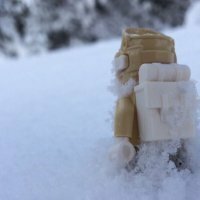 He was never really meant to be much, just a figure for the store, but an energy and focus developed around him, so much so that he now also has his own minifig. An incredibly rare and hard-to-come-by minifig, but it's never been done before. I got the sense that Lester has become the heart and spirit of the store; another member of the team, if you will. The nice thing about this little area is that it's great for having your picture taken, and of course there is an ever-obliging store team member ready to offer to help if you're nearby. Those of us who attended this event were given two scratch cards. One had a rare opportunity to win a Mosaic from the new Mosaic Maker (more later) or 40139: Gingerbread House. 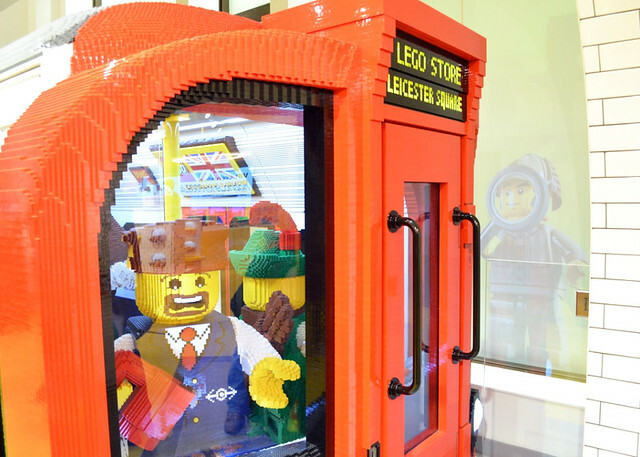 The other had a rare opportunity to win a Lester minifig or a 30472: CREATOR Parrot polybag. I went away with a 40139: Gingerbread House and a Lester minifigure, and I'm pretty happy about that! It's difficult to get the whole model in, because it's huuge! 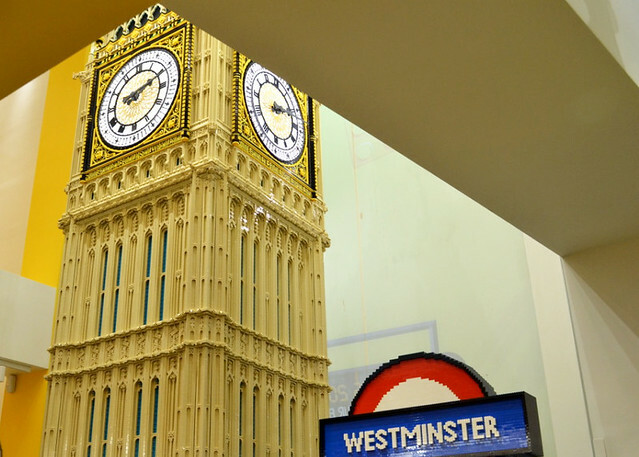 It's a 1:15 scale model of Big Ben (the Elizabeth Tower; Big Ben really being the bell) and it stands at 6.5 metres high, reaching right up to the second floor. The level of detail is incredible; it's built out of 344,020 LEGO bricks, weighs 1,035 Kgs and took six builders 2,735 hours to complete. It is truly stunning, and it even features a working, backlit clock - it chimes every hour with a replica sound of the real Big Ben bell. 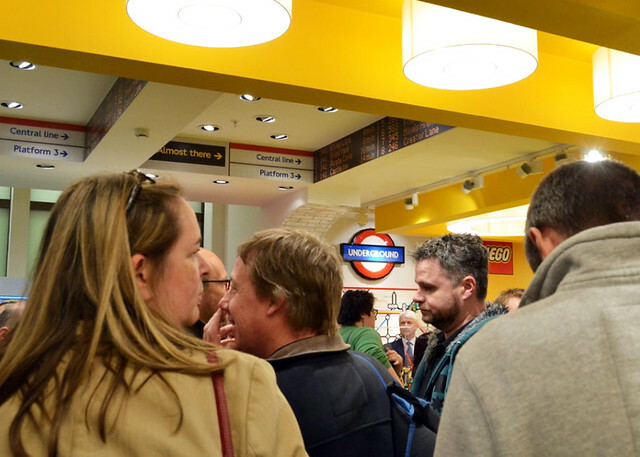 It, like other areas of the store, has a corresponding Tube stop, namely Westminster, appropriately. Even from the second floor it's difficult to encapsulate the magnitude of this build, and you can see more brick-built London figures at the base. From this vantage you can also see the beautiful London Underground store entrance archway. 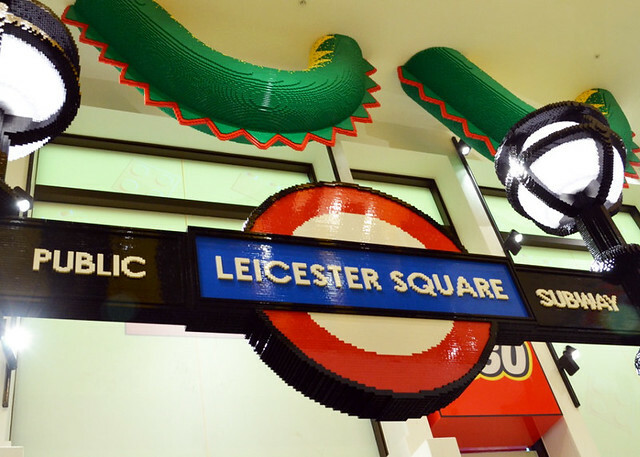 Built in the style of real London Underground signage with "cast iron" street lamps, it stands at 4.2 metres high (so you won't bump your head when you pass under it) and is composed of 81,100 LEGO bricks. 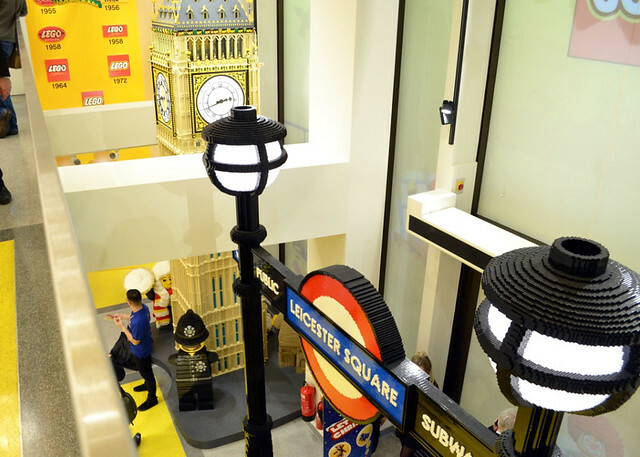 it does provide a magical entrance to the store, and marks a great beginning to a very London-themed experience. Here he is! Brickley! And he's been given a British makeover too. 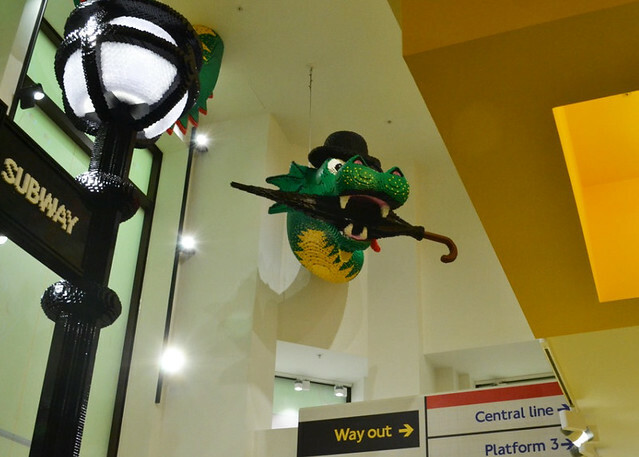 Just like Lester, every bit the British City Gent, Brickley now sports an umbrella, a monocle and of course a bowler hat. He's actually three separate builds; his tail is somewhere over Lester. All-in, he's 250,785 LEGO bricks. Brickley guards the corner next to the Tube carriage, so now we should head on up those stairs. But you don't get very far, because as soon as you look up the stairs (to see where you're going) your eyes are assaulted in the most pleasant way. 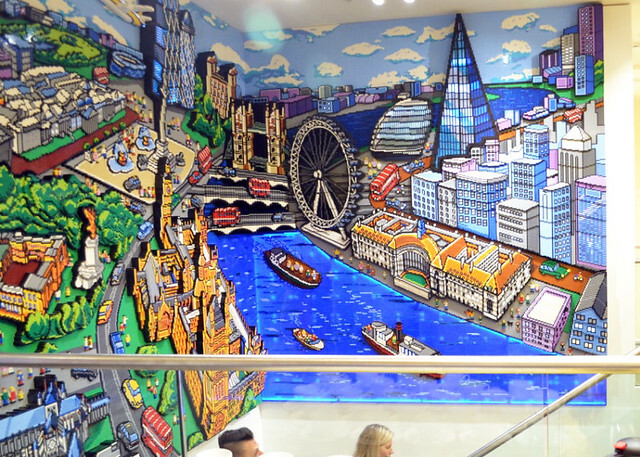 All around the stairwell is a magnificent, enormous, 3D LEGO mosaic of the London skyline. It is so vibrant and detailed, and because it's 3D it really comes to life. The perspective is wonderfully done and the designers have tackled the fact it continues around a corner incredibly well. There are 265,557 LEGO bricks in this mosaic, and there's a good vantage point out of the way of traffic on the second floor from which to admire it. If you've ever travelled on London Underground (particularly Bank station) you may be familiar with the 'Mind the Gap' recorded announcements. 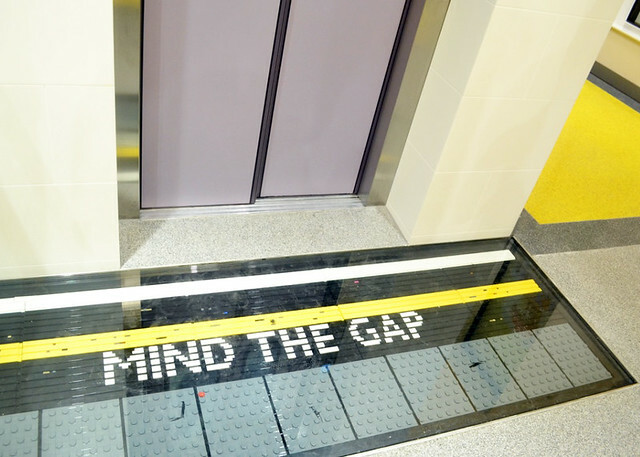 It has become somewhat of a meme, and having a nod to this brick built into the floor by the lift (elevator) access on the upper floor will likely raise a smile to those familiar with it. 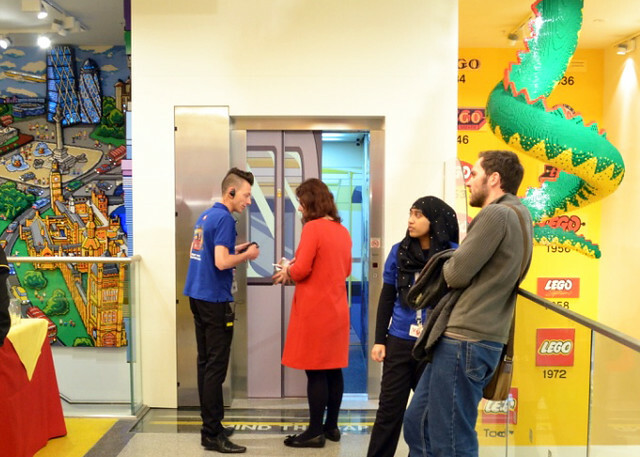 The lift itself is even designed to look like a Tube carriage. 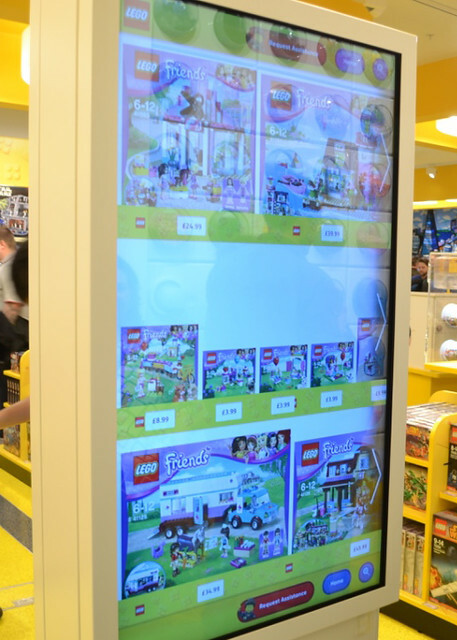 Now possibly one of the most exciting NEW features in this store is the Mosaic Maker. I understand that just installing this machine on the upper floor was one of the biggest challenges of the whole store design and execution. It's a brand new experience - it works like a photo booth initially, but having captured your image it converts it into a mosaic. In under ten minutes the machine produces printed instructions, and the bricks required, for you to create your own mosaic of yourself! 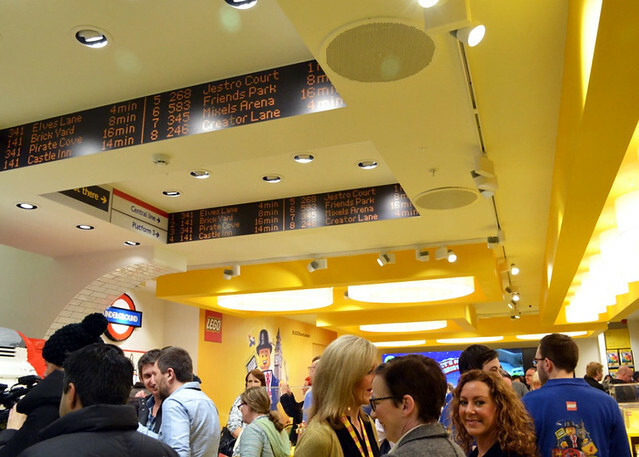 Leicester Square is the first store in the world to provide this unique experience, but I doubt it will be the last. 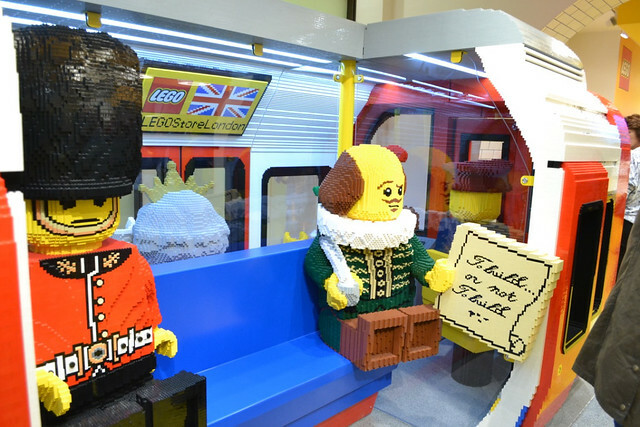 Tucked away in another corner is yet another British icon brought to life in LEGO bricks. 20,700 LEGO bricks to be precise, and all these touches keep reminding you (in case you should ever forget) that you are in the very heart of London. There's bags of space on the upper floor, just as there is on the ground floor. Here there's also a 'U' shape of 'Master Builder Playtables' - essentially an opportunity for children to get their hands on bricks and build according to their inspiration. 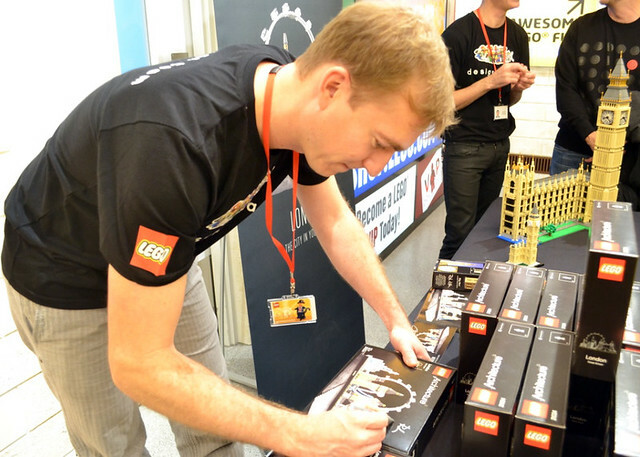 Additionally this area will play host to Certified LEGO Master Builders, who are to scheduled to visit to inspire children's creativity and share their tips and tricks. I suspect they may well be just as popular with AFOLs as with children. 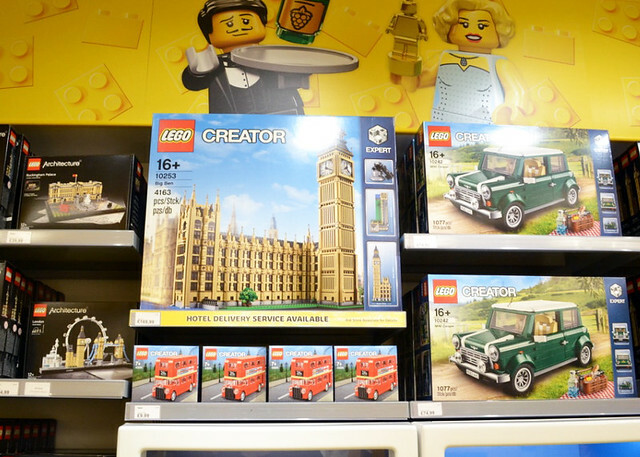 If there weren't so much space in this store then you'd be tripping over the brick-built British icons. 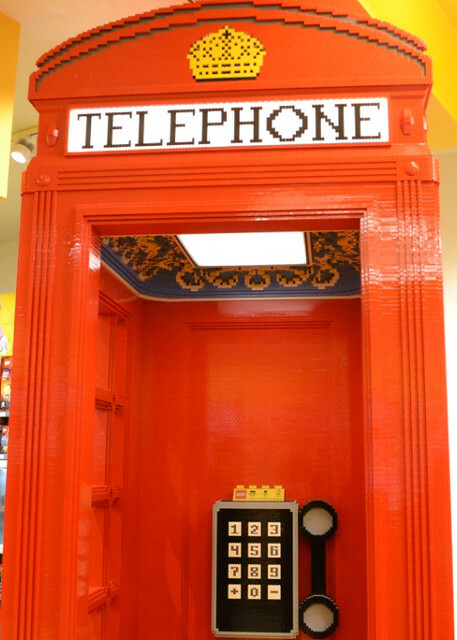 Or falling into, in the case of this life-sized telephone box. Sadly the real thing is quite rare out on the streets of the UK these days, but there still are some around - quite a few are used as libraries. No, really, they are. This is a wonderful model, that you can walk (or fall) into and I swear I heard it ringing. The details are just great including the decoration on the roof interior, the crown, lettering and the relief work on the sides. 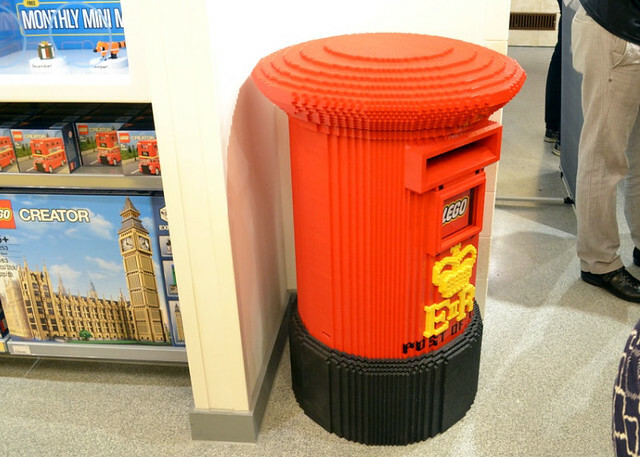 The whole thing stands at 2.6 metres tall and was built using 220,470 LEGO bricks. Not every model in the store has to be a British cultural icon, and one of the arguably most successful themes for LEGO is represented too. I'm really pleased it's not another Stormtrooper, as I'm getting rather used to seeing those wherever there's a large amount of LEGO for sale. 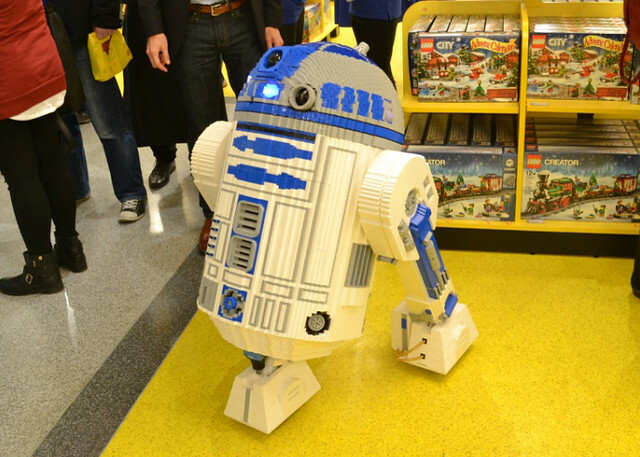 Don't get me wrong, I like a Stormie, but having R2D2 is way cooler, and he lights up too. I think R2 will be right at home in Leicester Square. 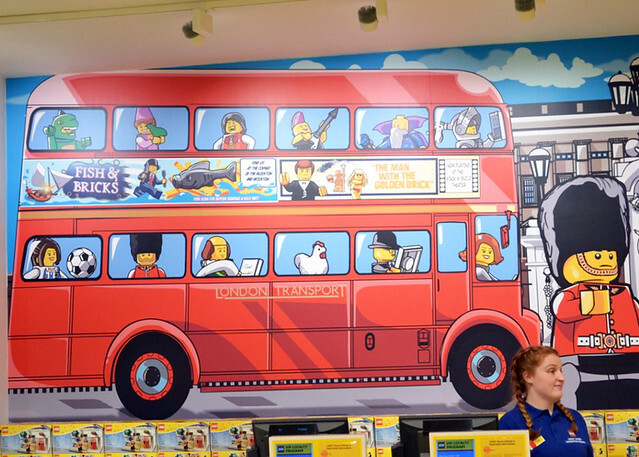 The wall murals just keep on with the theme, and a Routemaster bus will tug at the heartstrings of any Londoner whilst the big red bus is well-known all over the world. "There's a chicken on that bus." says Pep. "Uh huh. London." I reply. There is so much new technology plugged into this store; here you can see the giant tablet. TLG call it the "Digital Endless Isle" and the store employees are really keen to give you a tutorial in how to use it, but you really don't need one. If you have the technological savvy to be reading this article in the first place, you'll be fine. It's just a giant touch screen and you just touch what you want and you can find out about available sets and call up all the information you can usually find on Shop@Home. There's also a "Request Assistance" button which, when pressed, sends a message to the smart watches of store staff who will come and help you. I would, however, be amazed if someone hadn't already approached you to try to help you anyway, before you get to that point. Now is a great time to talk about the staff at the store. 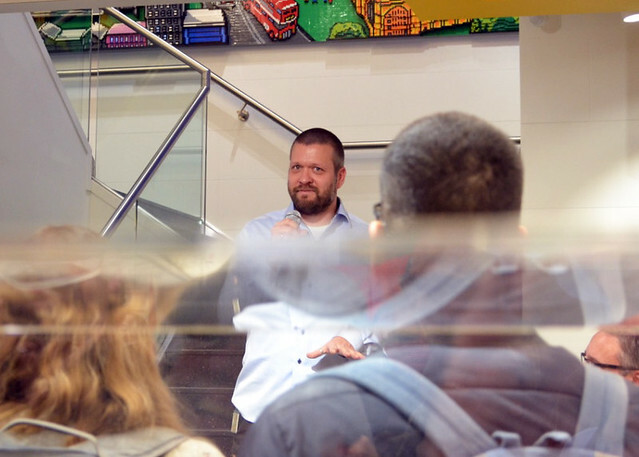 Every single person was incredibly friendly and enthusiastic; really warm and welcoming and so smiley. Talking to them, every one was so happy and excited to be working there (one young woman told me she cried when she got the job! ), and spoke highly of how they are encouraged to grow and be welcoming rather than follow a script. I think a large part of the great experience at this store will be down to the staff, and in this area TLG have nailed it, because the staff were absolutely great and it sounds like the company nurtures this. 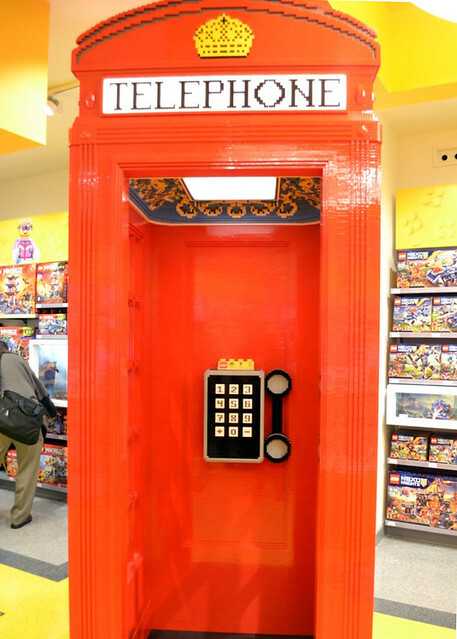 LEGO have gone all out with this store. It's their largest store to date, and the Flagship store in the UK, and they really have made it a destination store. 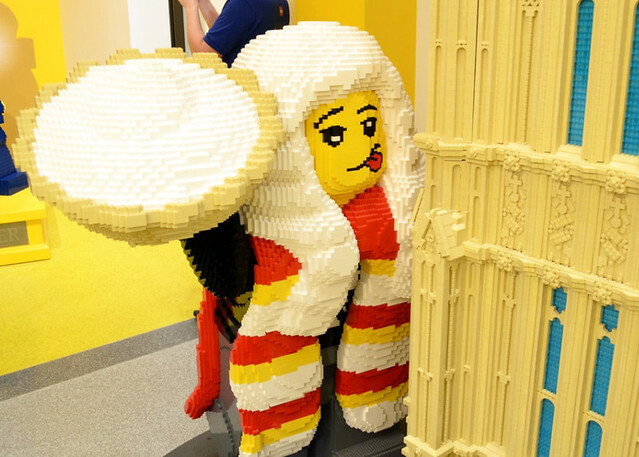 It's just as exciting for someone who lives in London as it is for a tourist visiting from any part of the world, and they've absolutely gone to town with jam-packing LEGO brick built British cultural icons into the very large space. There's such innovation here, with the very first Mosaic Maker and the Digital Endless Aisle, plus there's also a LEGO Minifigure Scanner (which we didn't see, because the store was covered) which is an interactive experience outside the store where people can (apparently) find out which LEGO Minifigure they are. Add to that the truly incredible decorative and interactive models (five tonnes in total; over 1.7 million LEGO bricks) in a fabulous location in the heart of the most touristy part of London, with fun activities like the Passport system and Master Builder Playtables alongside a ginormous variety and abundance of actual LEGO sets. We had a fabulous experience there, and I must thank TLG for hosting a sneak preview for fans, and for inviting us. 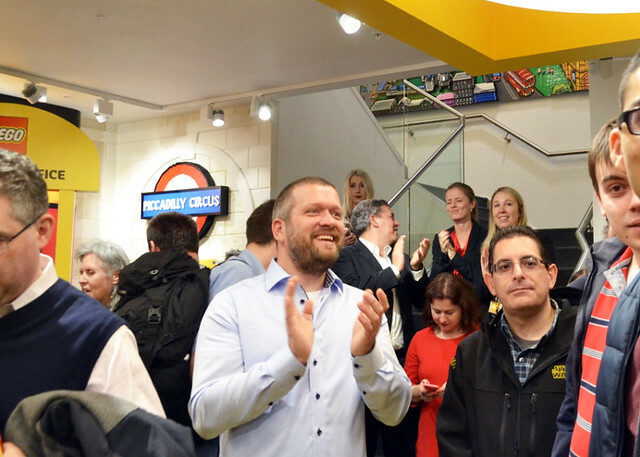 Clearly a huge amount of effort was put into creating the store, and also hosting the event, and it really paid off. 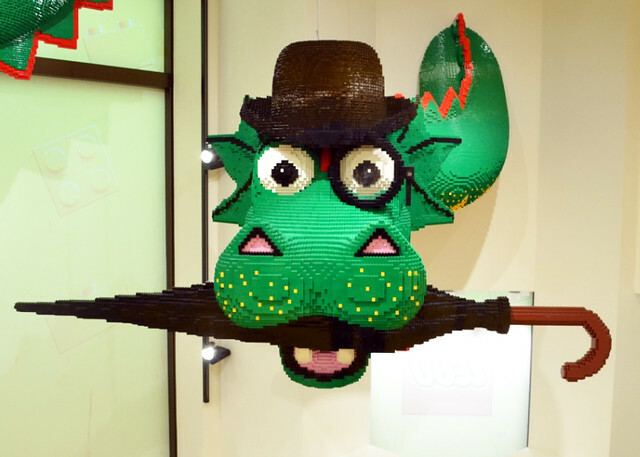 So overall, is it worth visiting the Largest LEGO Store In The World, in one of the most exciting, diverse, vibrant, iconic, historic and beautiful tourist destination cities in the world? Well, only you can decide for yourself, but I'm certain I'll be back. Thanks for reading, I'd love to hear your comments. First off, thank you for taking the time to do this amazing review! It's great to see all the various build the stores has incorporated. I love the London theme to it. I absolutely love the Tube lift I'm definitely hoping to go there soon! Brilliant review, thank you for sharing! I can't wait to go there myself over Christmas! Splendid outstanding event review report! Thank you Pandora. I am always fond of London very much and the store design and layout for the wholesome of London-centric icons are just all over the place. I am very fond of the Tube map, 3D display and many other large scale built. It is very enjoyable to view these wonderful images and your lovely comments accompanied with it. I just need to plan another trip again and is simply need to be soon. How I wish it was ready, 2 months ago! Nonethless, I am truly enjoy returning back to London and this is one of the awesome 'push' factor for me to come again. Wonderful coverage and thank you! I hope you and Peppy have great fun together! I LOVE that red Double Decker Bus I saw in the background of your pictures. I had a red bus like that as a kid (Hot Wheels type. Not sure where I got it -- maybe Florida's Disney?) but have been fond ever since. Not that they are easy to find over here. I got a freebie double decker bus from Lego a while back with purchase but had no idea it was available as a purchaseable set now! Great review! Hopefully someday I make it back to London. The PAB wall did not seem much larger than that of the typical store. I think downtown Disney in Orlando is still the largest I have encountered so far. What did you think of the PAB wall in the new store? I'm going to add a little here! It was so much fun to go there and great to meet up with friends to do so. The space, the decor and the variety of sets available were wonderful. 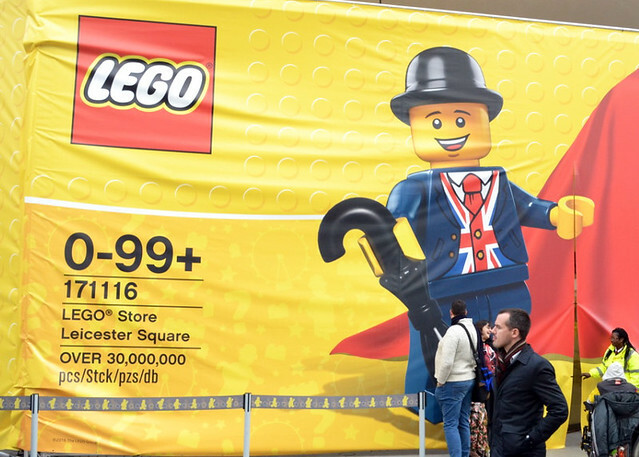 Also, as I traipsed around London after the event when we'd all gone our separate ways, many a small child was excited to spot a LEGO branded shopping bag. makes me really miss the UK where i've lived for the past 18 yrs and left before this store opened.. must go back! Wow, I thought we had a big store here in Anaheim, Shame It wasn't there two years ago, I was in london! Great review. Visited on opening day and found it too overcrowded. Went again today and they were limiting the numbers going in. It was much better, managed to get a few pictures and came away very happy. Having said that I thought actual product availability was poor, in Technic none of the recent(bucket loader, claas xerion) flagship models were available nor were they on show. This surprises me greatly. I got a freebie double decker bus from Lego a while back with purchase but had no idea it was available as a purchaseable set now! Beautiful store, although I did have to chose "Not on your nelly!" as my poll option since obviously I live in America and this is a bit of a trip just to see the store! Anyways, I hope that mosaic maker becomes more common worldwide! Thank you for the brillant review. TLG need to rethink the availability of Lester. Even if there is a slight difference in the colour of the new version. They could sell a million of these every year. Wow... that's one awesome store. I'm speechless. Wow. I hope that something of that detail comes to a store in our country. Oh, I changed my mind. 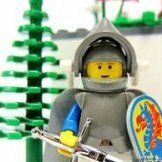 I will be contented when the price of Lego sets in our country will go down. It surprises me too to hear that the products weren't available, as everything looked fully stocked when I visited (well, for about 10 minutes, anyway). 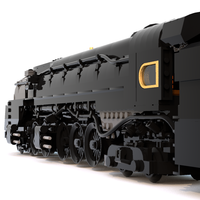 I may not have looked too hard at Technic, and therefore I didn't notice that their models weren't on show, and I suspect sheer volume of customers may have depleted their stock as I'd be amazed if they hadn't made shelf space for such a big-selling line. Thank you all for your comments, and for taking part in the quirky poll! Thanks for sharing. Very detailed review. Still wondering when TLG opens the first store in Switzerland? It was certainly a great day and as you say a nice 'destination' for part of a London visit. I'm glad you got a Lester, but as someone else intimates they have missed a trick there as they could sell 1000's of these. Let's hope they have an idea up there sleeve? Mind you that might upset the people who've got them on eBay already? It was amusing to see myself in your outside pic! I was there for the opening on Thursday, and it was too crowded for my liking. But then again I expected that would be the case. A few years ago I went to the first anniversary event of the store in Antwerp and that one was pretty crowded too, especially for a store the size of a shoebox. together at the hotel afterwards. I reckon I'll visit the store again in a more quiet period, so I can finally enjoy and take pictures of all the builds in the store. I can not wait to visit the London store. My partner and I will be in London in March. We did visit the Bordeaux store in July 2016 that was great and we are always in the Liverpool store. I saw a nice long YouTube video tour and it seems like 90% gallery and 10% store. 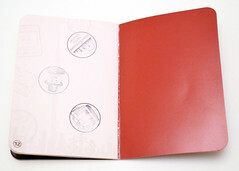 What's the purpose of having passports stamped? The things that would get me excited would be a huge pick-a-brick wall with many good pieces in good colors and a wide variety of current and past sets at reasonable prices.